Acarus siro, also known as flour mite, belongs to the Acardiae family. A. siro is recognized as a storage mite, an important environmental allergen and a common agricultural pest. The primair food sources of A. Siro are flour and cereal products but it also feeds on house dust, straw and hay. 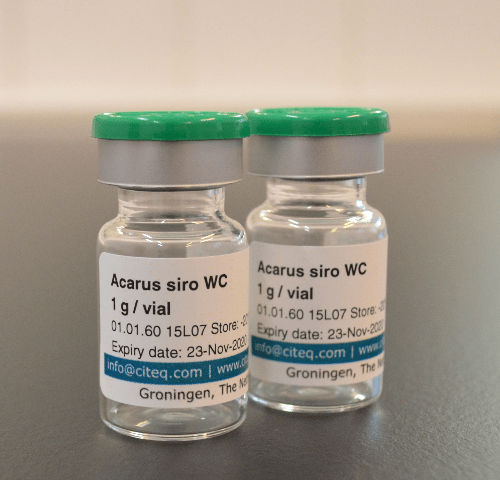 Acarus siro is a possible cause of allergic disorders, mostly among farmers, but also within urban homes. Common allergic disorders are allergic rhinitis or asthma and atopic dermatitis. Whole culture (vial of 1gr) A whole culture consist of all the material of the storage mite cultivation. This means: mite bodies, eggs, larves, cultivation medium and the feaces. Whole culture contains all components which are also present in real life and this is exactly what atopic patients respond to. 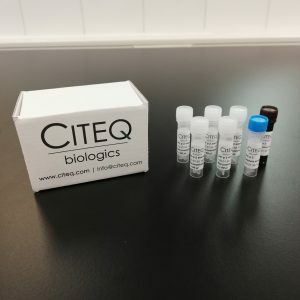 Citeq produces a controlled cultivation of storage mites. Extract of whole culture (vials of 10mg, 100mg or 1g) Whole culture which is extracted. Defined allergen source material, we deliver our material with extensive information about the amount of allergens in our material so you really can tell what you are using for your application. Large batches, we produce in large batches so we can deliver from the same batch over a longer period of time. This means you are assured of the same material and consistency. If you are using our material and you are satisfied with it you can even place a reservation of a specific lot so you will receive the same material in the future. Freeze-dried, our material will be delivered in freeze-dried form (lyophilization) to assure a long shelf life and can easily be used to reach targeted dilutions. 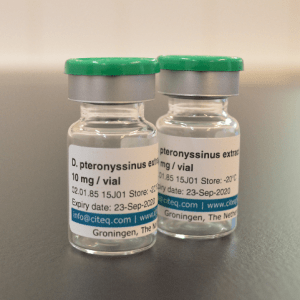 Available in different sizes such as 10 mg, 100 mg and 1 gram (specific sizes can be delivered on request). No animal or human components, our mites are cultivated on defined media without any animal or human components.